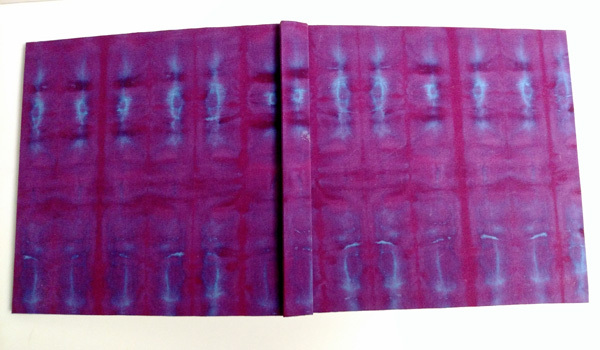 I also made a new daily watercolor sketchbook using the same paper and one of my newly dyed pieces of fabric as the bookcloth. 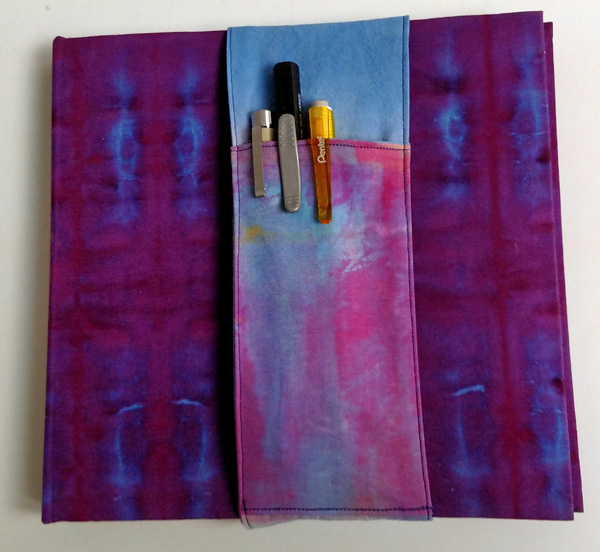 I love the pencil/pen/eraser pocket I made for my last daily sketchbook, so I used some of my dyed fabric samples to make one to go with a purple and blue book. It is very convenient to have these tools readily available when I'm carrying around my sketchbook and eventually will have a multitude of colored pockets to match them. 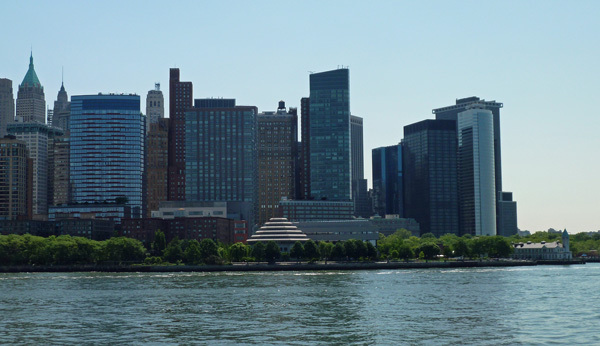 This is a view of the Southern tip of Manhattan, and the trees along the water are part of Battery Park. The multilevel triangular-roofed structure, at the bottom of the photo, is the Museum of Jewish Heritage, and we spend the morning painting, just to the south of that building, and in the afternoon draw a clothed model just to the north of it. 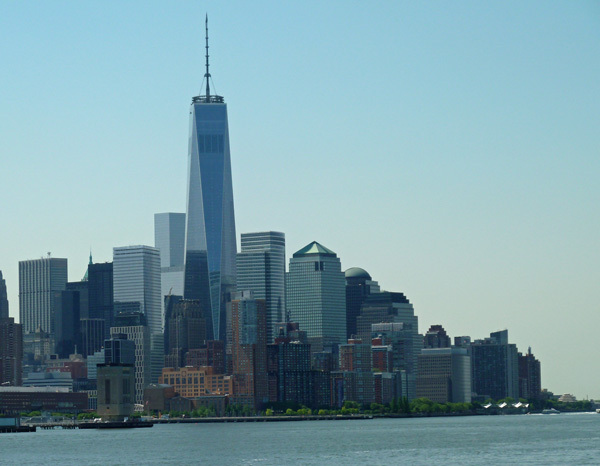 Turning my camera a little further North and you can see The Freedom Tower, the new World Trade Center, which dominates the skyline. 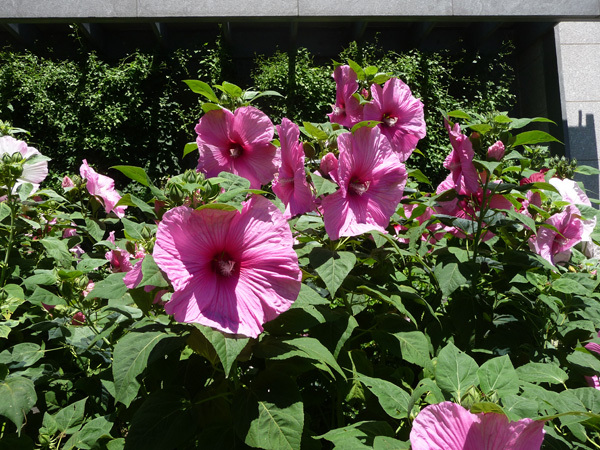 The gardens surrounding the Museum are full of dinner-plate size hibiscus this month every year. If I turned around while painting, this is the view I would have seen. 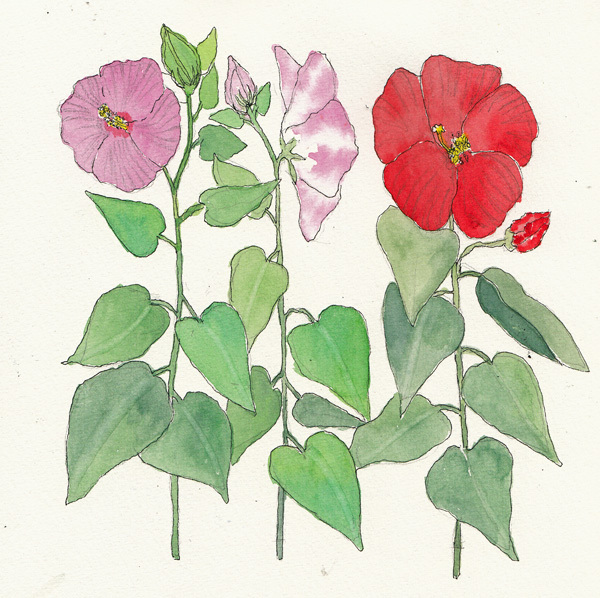 My first painting on Wed. was a composite of the 3 color flowers on display. 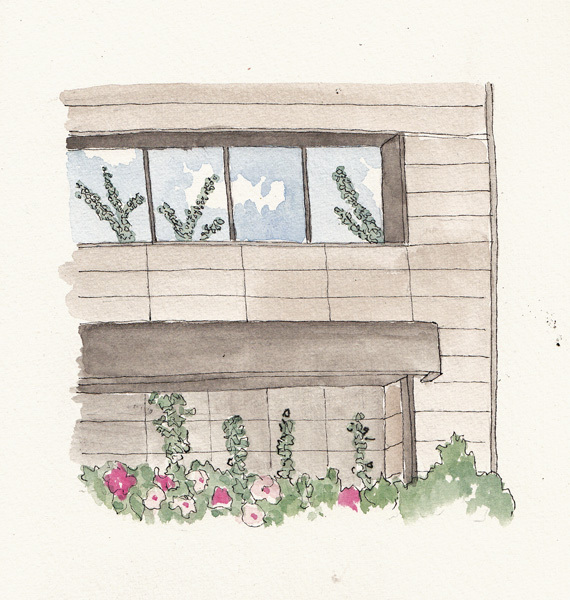 Then I just looked up, and decided to draw "what was in front of me" - the wall of the Museum with sky, clouds, and trees reflecting in one set of windows. After lunch we moved around the Museum, to the area of the Park known as South Cove, for Figure Al Fresco to draw Rebecca. She is a model who I like to draw best in very short poses. 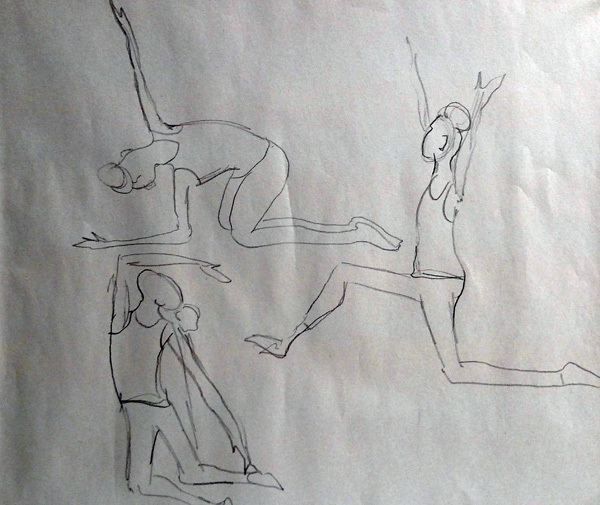 Here are the last 4 of my 10 one minute poses. 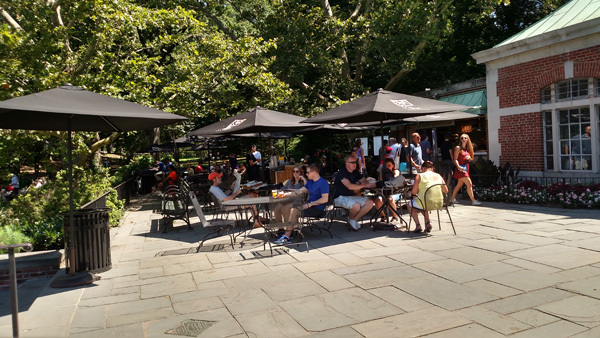 This is a free program sponsored by the Battery Park Conservancy and they even bring art supplies to every session from the beginning of May to the end of October. 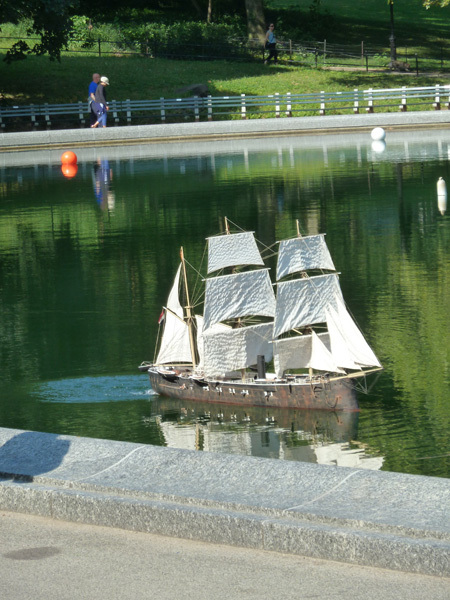 We live within walking distance of the Conservatory Water in Central Park, and this is one of a series of photos I took this summer on mornings when we go for coffee and watch the activity of the toy boats in the pond. This is Le Pain Quotidien café - the source of our coffee and my croissant. Most people stop to buy food and continue on their walk, so slowly sipping coffee like we do is not a problem. Children rent remote-controlled sailboats for the pond ($11 for 30 minutes). The "big boys" bring their own toys and the handcrafted beauty in the photo below plays Dvorak's New World Symphony as it sails! 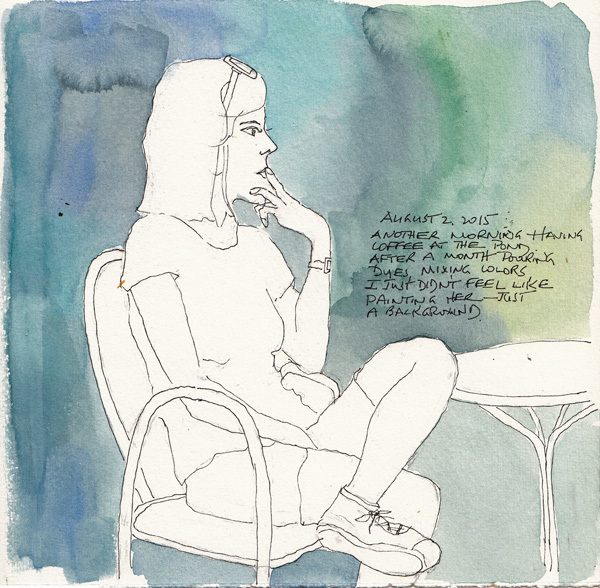 I frequently draw/paint while we are there and here are 3 recent sketchbook pages. Dogs can be off their leash until 9AM. New York City dogs are very well behaved, as anyone knows who watches many dog walkers with 6 -8 big dogs on a leash. They don't bark or nip each other, and I love watching a group of them sitting patiently watching an apartment entrance waiting for their "friend" to come out to join them. 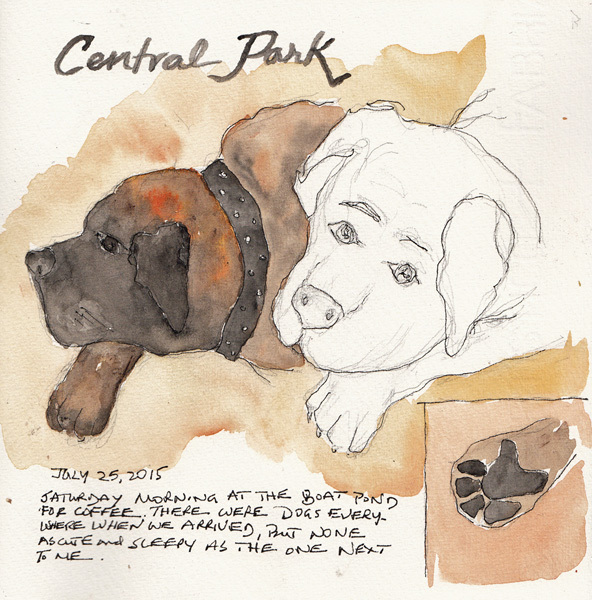 One of the big dogs took a nap at my feet, and I sketched him in two positions before his owner woke him to go home. 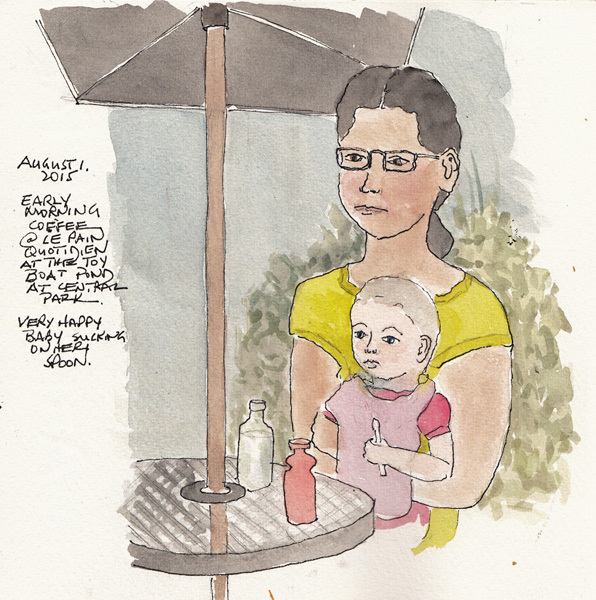 This weekend I sketched a Mother and child on Saturday, and another contemplative young woman on Sunday. There are still lots of flowers in bloom, but there were lots of bees buzzing around, so I just looked from a distance and didn't try to draw them. 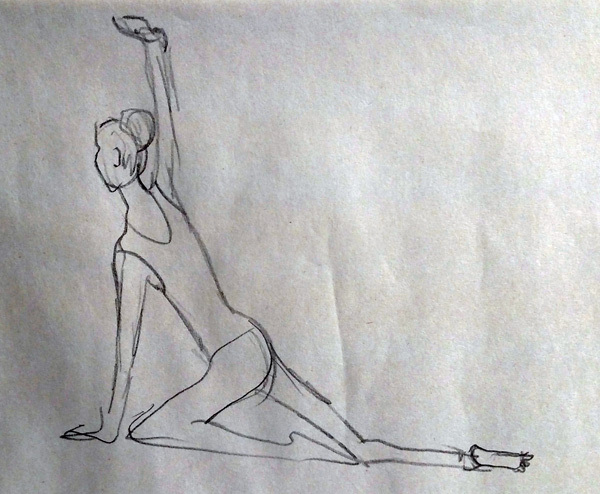 I went to two drop-in figure drawing sessions last week. 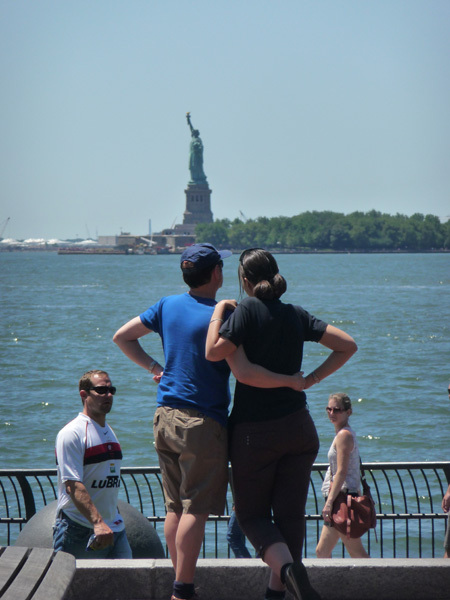 The first was outdoors, with clothed models, in Battery Park in New York City. 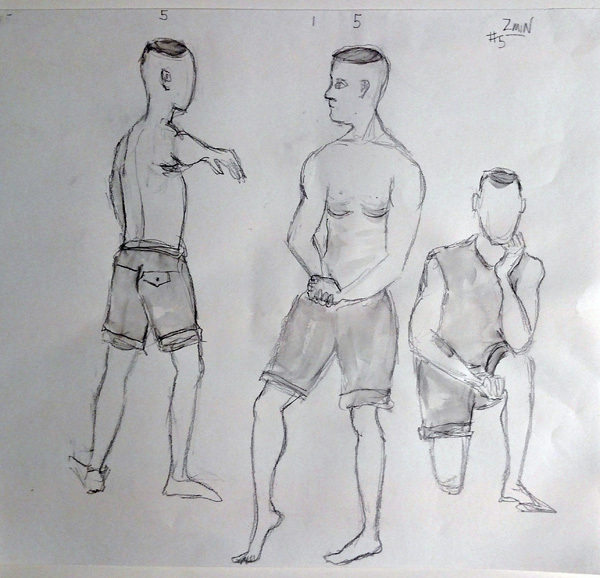 We had a male model with weight lifting musculature and poses. 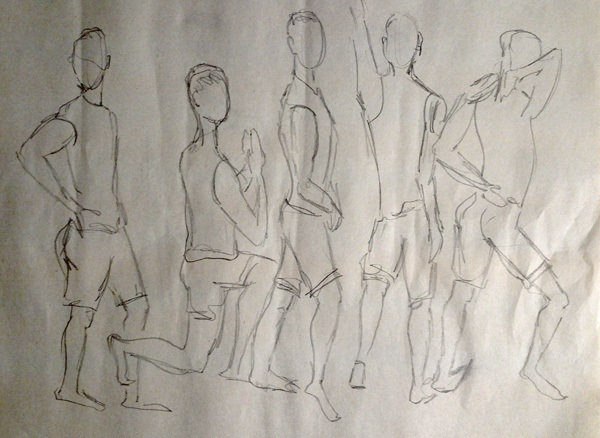 I did all 10 one minute poses on newsprint with a graphite pencil and was pleased that I could capture gestures in such a short time. Here are the 10 drawings, five on each page. These are photographs on large sheets. 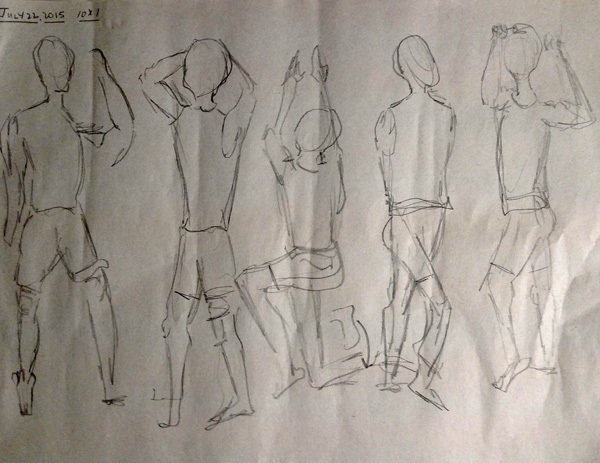 Five Minute Poses: The model had shaved sides and hair on top of his head. My second session was at Meetup, and the model was familiar to me from this site and Society of Illustrators. 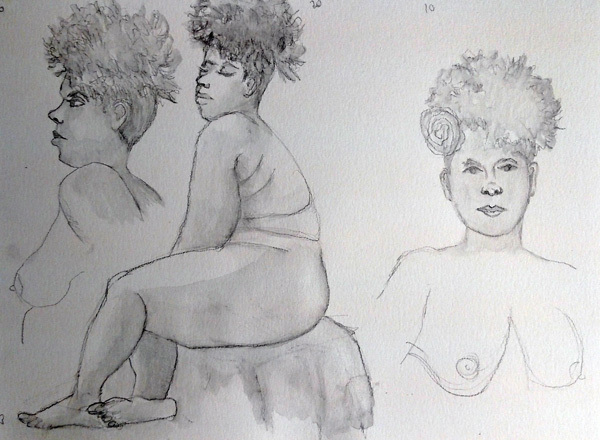 On this sheet are two 10 minute portraits and one 20 minute pose. The Museum of Modern Art (MoMA) has a current exhibit of Warhol prints, including all 32 varieties of Campbell Soup Cans. I don't care for his pop art product illustrations, or his many screen prints from celebrity photos, but I was really intrigued with his figure drawings, portraits, and a wall of shoes using his "blotted line technique." It wasn't well described in the exhibit, so this week Benedicte and I went to one of the drop-in MoMA Art Classes associated with the Warhol exhibit, and made "blotted line drawings." 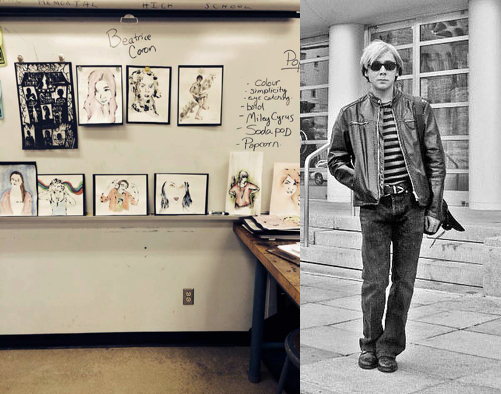 Here is Andy Warhol with the type of prints that I loved - this image is from ContemporaryCalgary.com in an art education article. 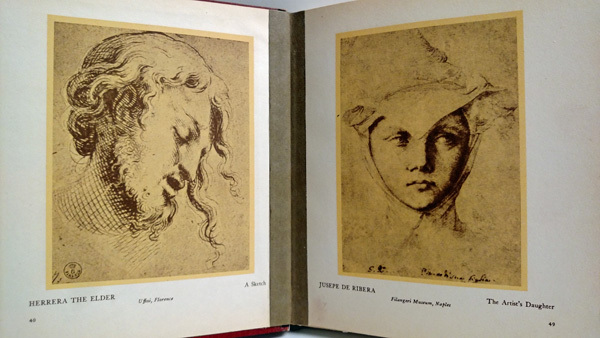 This is the link to the MoMA exhibit and several of his blotted drawings. At MoMA there is one full wall of the Warhol shoe illustration ads for I. Miller. 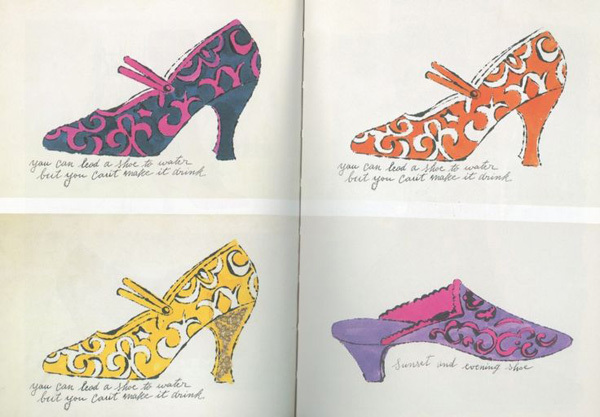 His weekly shoe illustrations in the New York Times revitalized I. Miller converting it from a dowdy shoe company to the shoe brand for debutantes. 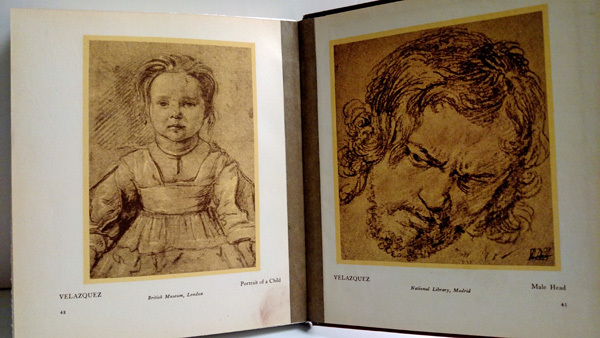 This photo is from images on the internet, selected because it shows the blotted lines very well, and the power of this technique to allow him to create multiple prints from the same drawing. For this technique you need non-absorbable tracing paper, a sheet of absorbable paper, and a pen that writes "juicy" ink lines. 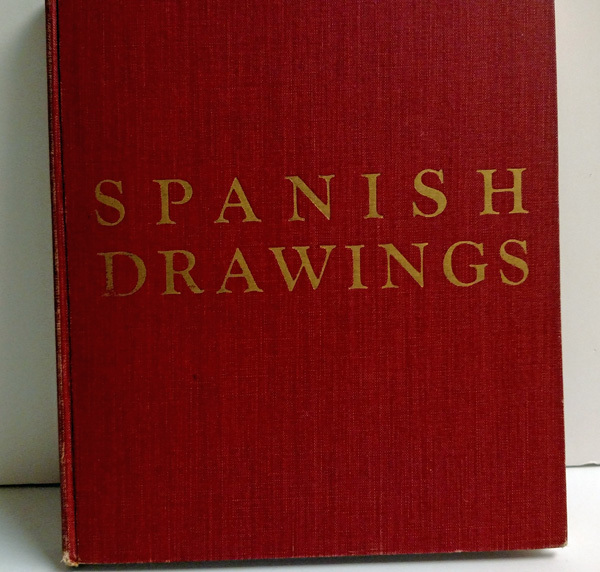 The tracing paper can be used to trace the desired image, or make an original drawing. Then it is hinged along the edge of the absorbable paper, making a little booklet. The back side of the drawing on the tracing paper is then outlined with ink, making very short segments of lines, and immediately flipping it over to print on the paper. This process is repeated until the drawing is completed. In the video at the end of the link below, you see how an image can be repeated over and over using the same tracing paper with new absorbable paper. 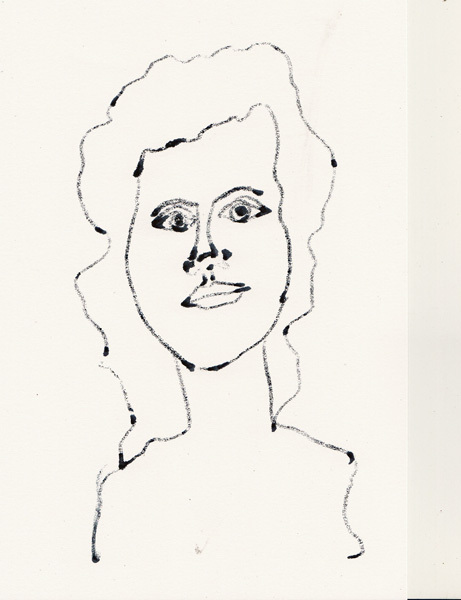 At MoMA they supplied us with a sheet of deli paper, taped to card stock, and an inexpensive disposable fountain pen. 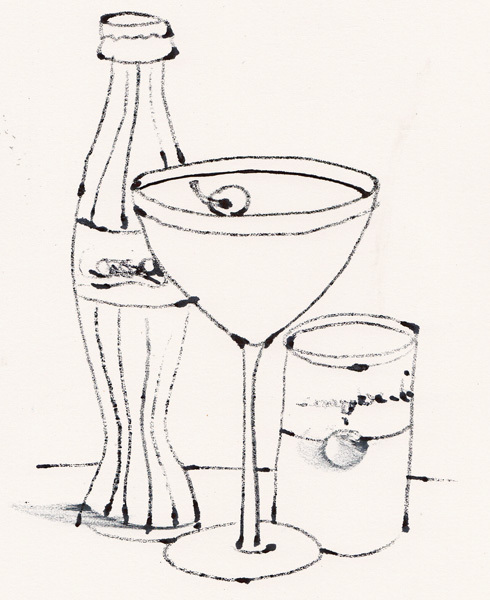 We also had Warhol-type props, including a Coke bottle, martini glass with cherry, Campbell soup cans, and a woman's dress shoe. Here are two of my prints. By the time I reached my 5th print, I decided to draw Axel sipping champagne. 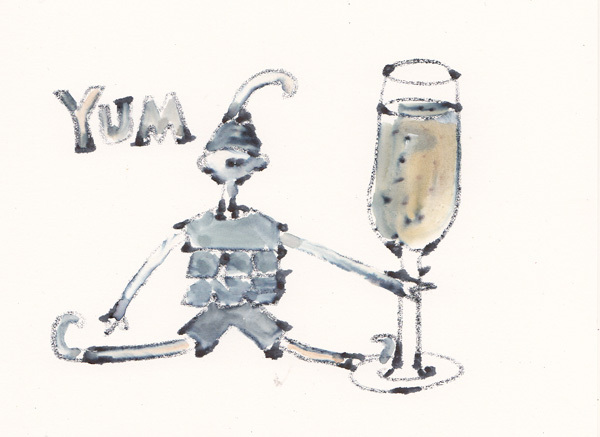 When I came home I added yellow watercolor to the champagne and discovered that we were using soluble ink pens at MoMA. But I wanted to show Axel because I wrote "yum" on the top side of the tracing paper, flipped it over and traced the line with the pen in short segments, and then printed the word on the paper - a 3 step method for having letters appear correctly! Here is an excellent tutorial followed by a 6 minute video demonstrating the technique and two shoe prints made from the same image and then painted, one with gold leaf applied at the end.